The Titan High School Volleyball team opened their new season in a new league against a strong Mountain Valley team on Friday, August 29. While often the first home match brings extra nerves and jitters, the home court provided an edge in the tightly contested match. The match turned into a battle early with each team hustling and making great plays. Mountain Valley proved to be a strong hitting team forcing the Titans to step up their defense and try and outwork their opponent. The first game ended up having the largest spread of points, finishing with a Titans 25-22 win. The Titans took the second game 27–25. The great passing of senior co-captain Katie Vandervoort allowed for some great hitting of junior Sydney Loyed. Loyed also provided some key serves throughout the match. After having to sit out most of the week due to injury, senior captain setter Kaitlin Councilman was back on the court quarterbacking the Titans. She controlled the tempo of the match with some good set choices, solid serving and making a couple of key setter tips. Falling behind the third game of the match, the Titans made a few more mental errors throughout the game, but refused to quit. Senior captain Mackenzie Mailly served four straight serves to bring the Titans back from a four-point deficit, but the Titans fell short and lost the game 23-25. Junior Hillari Spencer provided solid all around play for the Titans both offensively with some key kills, great passing and even stepping into to set when needed. The fourth game proved to be another tense battle with the Titans finally prevailing 25-23 and taking the match three games to one. Early Saturday, the Titans headed to Montrose for a tournament. The Titan varsity squad was set to play three matches against 4A and 5A junior varsity teams. These teams from larger urban areas have access to club programs and some schools have as many as 10 times the enrollment of 1A Crested Butte. The Titans opened up against Grand Junction High School and played well against the much larger team. The Titans dropped the match in two games 20-25 and 19-25. Senior Chelsea Dill stepped up her game and had some solid hits and helped the Titans score nine points off her serve in the match. The next match against Montrose JV proved to be the most inconsistent of the day. A fresh young Titan line-up that including only one senior took the court in the first game against a strong Montrose team but came up short 12-25. The young line up started to find a rhythm and get more comfortable as the game progressed. Junior Kelsey Beltz got into a great rhythm serving four straight points against a good Montrose team. A different line up took the next game to the max but came up short at 26-27. 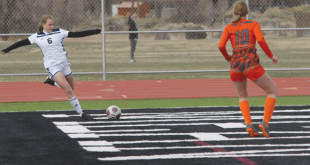 Historically a very strong defensive player, Mailly finally found her groove and stepped up her defense, making a few extraordinary plays to save some key points. Spencer contributed again with solid overall play including some key serves and some key kills under pressure. The final match of the day was against Grand Junction Central and proved to be the most competitive. Central proved stronger and took the first game 27-26. Crested Butte stepped up the next game and won 25-14 with the Titans scoring seven points off Mailly’s serve. In the third game of the match, the Titans started sloppy and allowed Central too big of a lead to come back and lost 8-15. Next Saturday the varsity team travels to Sierra Grande and will play four league matches. The Titan junior varsity played Mountain Valley on Friday and also played five matches on Saturday in Montrose. 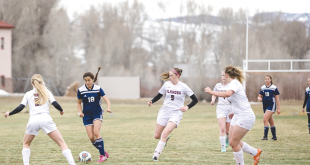 They lost Friday night to Mountain Valley and were able to pull out a victory against Ouray on Saturday.